British trumpeter Dr. Eddie Severn is notable in his ability to adapt to many musical styles. From his extensive work as a lead trumpet player in the commercial music world to his innovative performances as a soloist playing his own compositions, Severn is equally at home playing rock, jazz and classical styles. Eddie has performed with Maria Schneider, Phil Woods Big Band, Dave Leibman Big Band, The Temptations, Kenny Rogers, the English Symphony Orchestra, and more. He has also performed and recorded music for television, radio and theatre, as well as on numerous pop sessions and touring shows. His experience as an educator has led him to faculty positions at the Royal Scottish Academy, Napier University and Birmingham Conservatorie of Music. 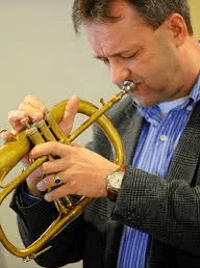 Severn holds a Doctor of Musical Arts from the University of Salford in Manchester, England and is currently Director of Jazz Studies at Lock Haven University in Pennsylvania.